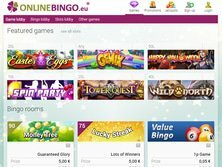 OnlineBingo Casino is providing its services since 2003. It is particularly well known for honoring large payouts and delivering quality bingo games. The website relies upon the software which is provided by reputable companies such as; BetSoft, Play'n Go and Parlay. Unfortunately, the site has not yet transitioned into the mobile-friendly mode. However, it still manages to attract a lot of traffic with a steady supply of games and a couple of promotional deals. It is worthwhile to examine those deals in more detail. 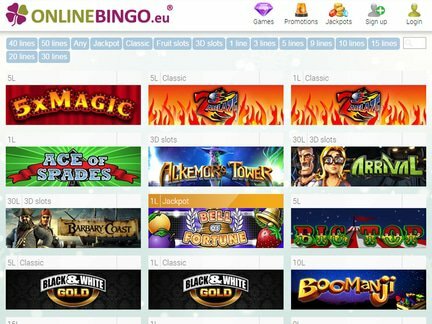 The players won't see a lot OnlineBingo Casino Bonus deals on the website. The first deposit deal is the main attraction. Essentially, it allows the user to receive 100% up to €100. Furthermore, the website offers a €10 freebie. The players can use the freebie bonus on any game, as long as it isn't a progressive jackpot. The winnings will appear as bonus cash. Each player must make a wager of €250 in order to change this status. Other bonuses can be earned through loyalty point collection. It's important to remember about the wagering requirement (25X the bonus amount) for the deals. The website doesn't appear to offer any cashback bonuses at this point in time. A number of payment options are shown on the casino page. They would include; Visa, Maestro, EntroPay, Visa Debit, Neteller, PaySafeCard, Skrill and Ukash. When it comes to security, the companuy uses 128-bit SSL Encryption Technology, which is the standard in the industry. The entire sign-up process only takes a couple of minutes. Just a few details need to be recorded. The players from certain countries won't be able to play on the casino site. The list of countries would include; Belgium, China, Cyprus, Hong Kong, Israel, Poland, Turkey and United States. The website has demonstrated that it is able to support the speakers of certain foreign languages, mainly French, English, German, Norwegian, Swedish and Spanish. The exclusive support for the € currency makes the website more accessible for players from the European continent. The site offers access to slots and bingo. The slots game category would include titles like; 5XMagic, Ace of Spades, Arrival, Barbary Coast, Bell of Fortune, Big Top, Black & White Gold, Boomanji, Cats and Cash, Citrus 7s, Cops N Robbers, Creatures of Rock, Deep Men's Chest, Desperados, Diamond Suprise, Double Diamond Spin, Dragon Ship, Easter Eggs, Fairground Frenzy, Fire & Ice, Fortune Teller, Fruit Smoothie, Fruit Zen, Funky Monkeys, Gemix, Get Cracking Video Slot, Gift Shop, 3D Slots, Golden Goal, Gorgeous George, Hollywood Reels, House of Fun, Irish Gold, Jewel Box, Karat Crazy, Jolly Roger, Lucky 7s, Living Large Video Slot, Makin' Bacon, Myth, Mermai's Pearl, Paparazzi, Pearl Lagoon, Pimp My Slot, etc. The bingo lobby also fetaures plenty of good stuff! The OnlineBingo Casino players must appreciate the fact that a download is not required to place a wager. The support for different languages is also nice feature from the player's perspective. The complaints do not show up on any public forums. The casino has an e-mail form through which it is possible to reach the staff. It also provides a help section where answers to the most common questions can be found. A live chat option is currently absent. The eGaming license from Curacao isn't a major achievement. It's just a stamp of approval on business operations. Nevertheless, it is a document which establishes legal operations and makes the casino credible in the most basic sense. However, the online casinos that go through a more rigorous licensing process tend to have a better reputation. Still, Online Bingo has been around for awhile and the complaints aren't piling up. Things appear to be going smoothly. In my opinion, the casino doesn't yet reach the level of award-winning online casinos. The lack of mobile options is a serious hindrance. However, the game options are fairly decent. I would definitely like to see better promotional deals. It's not enough to display two offers in today's competitive world. But I believe that the casino can still potentially appeal to certain types of players.